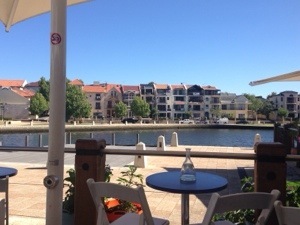 This is the beautiful view of the water sitting at Toast in East Perth. Toast is a very popular breakfast spot in Perth and draws a crowd, as we discovered, even early on a weekday morning. The staff were really friendly and greeted us as we came in and were happy to chat over the coffee machine. 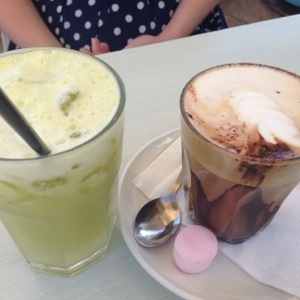 We rather ambitiously all ordered coffee and a juice or smoothie. Tempted by the oodles of choice on the impractically sized menus. 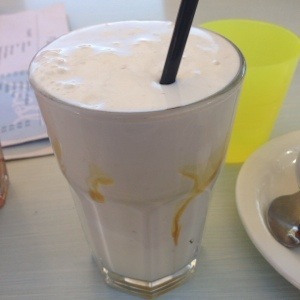 The best of the bunch was the banana and honey smoothie, it was thick, creamy and flavoursome. Everything you want in a fruit smoothie. It brought back memories of childhood summers with homemade banana smoothies, just as thick and delicious. 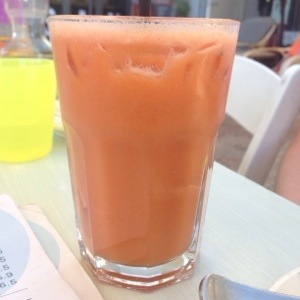 The Blimey juice included carrot, apple and watermelon. It was a touch bland but that comes with the ingredients, especially because watermelon dilutes the mix further. The beach bear, which consisted of pineapple, apple, ginger and mint, was very refreshing and summery. Though it could have done with a little more ginger, it was still very enjoyable. 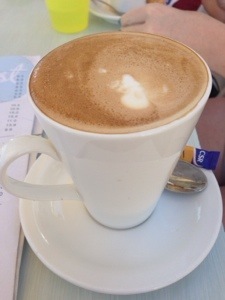 The coffees we had, including the mocha (as shown next to the beach bear above) were just average. The mocha did have a good chocolate hit though. There was nothing terrible but nothing particularly exciting about the coffee. Of the three meals we ordered two consisted of some form of ‘toast’, it just seemed appropriate considering our location. The other was actually the best of the lot though. This was the potato and mint pancakes, with chives and sour cream, salmon, poached eggs and as an extra we ordered a side of hollandaise, because when in Rome you order hollandaise! The pancakes were crispy and delicious, retaining a nice crunch on the inside. The potato was grated through. The salmon and eggs were perfect drizzled with lemon juice and were a great combination with the sour cream and chives. Of course the hollandaise was also amazing. 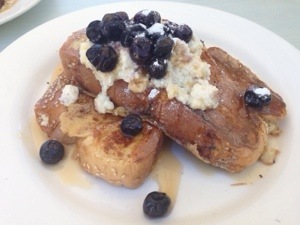 We also selected the French toast with ricotta, blueberries and maple syrup. It’s such a fabulous flavour combination, the sweetness of the maple syrup really balances the ricotta and the blueberries have a pleasant pop to them on your mouth. However the French toast was disappointing. It lacked the light fluffiness good French toast should have, and was incredibly dense, almost like it had been cooked in a sandwich press. It’s such a shame because we were really looking forward to their French toast, and it looked a treat when it arrived at the table. 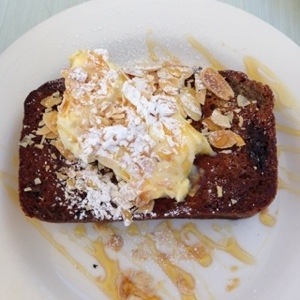 The last dish was banana bread, with roasted almonds, mascarpone cream and honey. We’ve tried this before and found it hard to go past it on the menu. You get a sizable piece of moist, flavoursome banana bread liberally drizzled with honey, though perhaps a little too much honey as it has a tendency to overwhelm the more subtle mascarpone. The roasted almonds were a refreshing change in texture, and added a nice crunch to the otherwise predominately moist and soft dish. 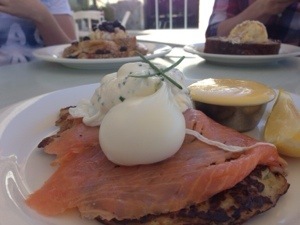 Toast is a lovely little spot for breakfast and deserves it popularity as one of the more interesting breakfast cafes in Perth, especially because it offers such great meals as the potato pancakes. Have you been to toast? What did you think? I am a huge fan of Toast. It’s a Sunday favourite for brekkie, if you can get there early enough that is! Early breakfasts are the best anyway because you suddenly have so much time left of your weekend!